Back cover for the new on-line Home Defense magazine. It’s another project of Delta Media, along with the United States Concealed Carry Association. Rifles shown: (left) left-hand Rock River AR15 with X5L light/laser and DSA FAL with a heavy barrel. Both are using EOTech red dots sights. Magpul AFG and Emag on the AR, VFG on the FAL. This entry was posted in light/laser, rifle, self-defense, weapon and tagged 223, 308Win, AR15, defense, FAL, hand, home, left. Bookmark the permalink. 3 Responses to “Home Defense” isn’t about homes. 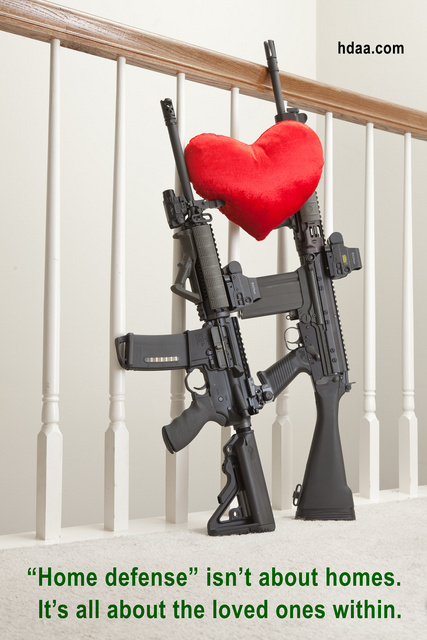 Cute, two rifles made in Illinois. Why is it that so many manufacturers operate in non-free states? Kimber in NYC, DSA, RRA, Springfield all in Illinois, and those are just the ones that come to mind without research. How do they find “gun people” to live and work in those states? In this case there are lots of gun-rights supporters in Illinois. Unfortunately they can’t outvote Chicago. I moved to Illinois for a year and a half for work, but didn’t settle down and buy a place until I could jump the border into Wisconsin (not as good as Indiana, but better than IL).